Wire Transfer or a Cashier's Check for Home Closing? Wire Transfer or Cashier's Check? Which Is Best? You're about to close on your first home and the title company tells you that you must have certified funds. You can either bring a cashier's check or you can do a wire transfer. What's the difference? 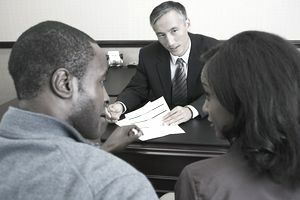 Will the money get to the title company in time if you wire the funds? There are two popular myths floating around out there about these options. The first is that a cashier's check can't bounce. Yes, it can. Cashier's checks can be altered by crooks or reversed by the account holder. The second is that wire transfers are instantaneous. They're not. Wire transfers can take some time under some circumstances although ordinarily, they are relatively quick. How Do Cashier's Checks Work? An account holder goes to the bank in person, provides identification, and requests a cashier's check from the bank teller. She must have cleared funds in her account to get a cashier's check. The teller will request the payor and payee names and dollar amount for the check. He'll check the account holder's ID and verify that she has sufficient money in the account to cover the transaction and that all recent deposits have cleared. He'll draw a certified cashier's check with her name and the payee's name on it and sign it. That's it. She's done when the teller hands the check over to her. Depending on her relationship with the banking institution, it might charge her a small fee for drawing the cashier's check. A wire transfer used to be delivered via telegraph, but that's changed. Most banks submit wire transfers electronically these days. The service many banks use for these secure financial messages is S.W.I.F.T. It stands for "Society for Worldwide Interbank Financial Telecommunication." You can ask your bank to do a wire transfer in person, over the phone, or even sometimes on the internet. That's obviously an advantage if you're pressed for time—you don't have to be physically present. But depending on the bank, the funds might have to be wired to a corresponding bank and this can delay receipt. Many banks send out wires only at certain times during the day. You could miss a cut-off time. The wire might also require approval before transmission. So, no, a wire transfer is not immediate. And you can't typically "undo" one, either. You can't change your mind at the last moment and reverse the transaction. Which is Better—A Wire Transfer or a Cashier's Check? Don't you wish that you could simply walk into your home closing with a big sack of money and just dump the cash on the table? Unfortunately, closers don't want the liability associated with that much cash. Moreover, transactions in excess of $10,000 in cash must be reported to the Internal Revenue Service. So you're left with a wire transfer or a cashier's check. Obtaining a cashier's check can present several problems. Some banks require advance notice before they'll withdraw a large sum of money and give it to you. Check with your bank before you need the money. And keep in mind that you might have to deposit the funds with the closer the day before closing. Wire transfers can present drawbacks as well. They can actually get lost. Numbers can be transposed. If you miss that day's deadline for wiring, it won't go out until the following day. The manager who must approve the wire might be out and unavailable that day. Title companies, escrow officers, and other closers can't record a deed until the equivalent of cash is in hand. These people represent both the seller and the buyer. They promise that the seller will receive the money when the deed is recorded. They promise to record the deed when the buyer deposits the money. The laws for this process can vary from state to state, but funds must often be deposited and available prior to disbursement. Funds received via wire transfer can often be paid out immediately, but funds received via cashier's check must be deposited the day prior to disbursement. And funds received in any other manner will delay disbursement. Make sure the funds are coming from a source that has already been verified by your lender. In other words, don't decide that in the interest of time—perhaps because you are traveling or otherwise incapacitated—it's OK for your parents to send a check into closing and you'll pay them back later. Make sure the source of your funds is an account your lender has verified or you might not close on time.